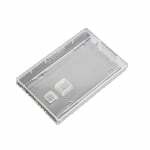 The FlashPad Wallet is the newest addition to our family of USB packaging. Leaner than the original FlashPad but featuring the same sturdy design, the Wallet retains that booklike feel that our clients love. Just like a personal wallet, the FlashPad Wallet is available as a bi-fold or tri-fold. The custom cavity is embedded right in the chipboard to hold slim flash drives or credit card drives. As an orientation kit, the Wallet gives new students, employees, and homeowners a digital alternative to a packet of forms and documents. Fit with a flash drive, your FlashPad Wallet can provide a more interactive presentation, complete with welcome videos, links, and pdf docs. The FlashPad-Wallet can be customized to hold USB drives of different shapes and sizes. It can also be customized to hold multiple drives, literature and other items. Additional tooling fees may apply. The FlashPad Wallet isn't just for flash drives. Present gift cards and credit cards in a whole new way. 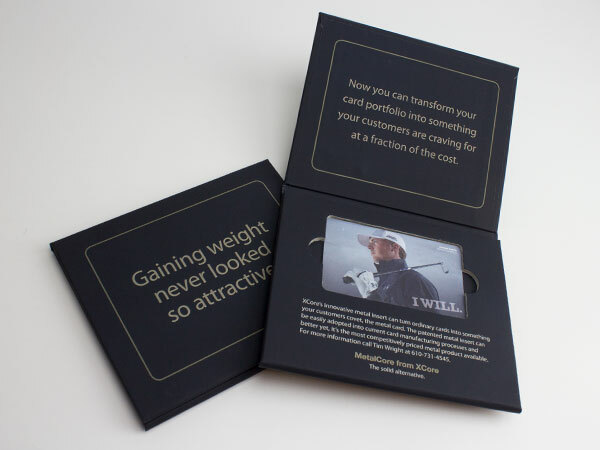 Add weight and warmth to notoriously impersonal gift items. Or present coins, badges, or other souvenir items. 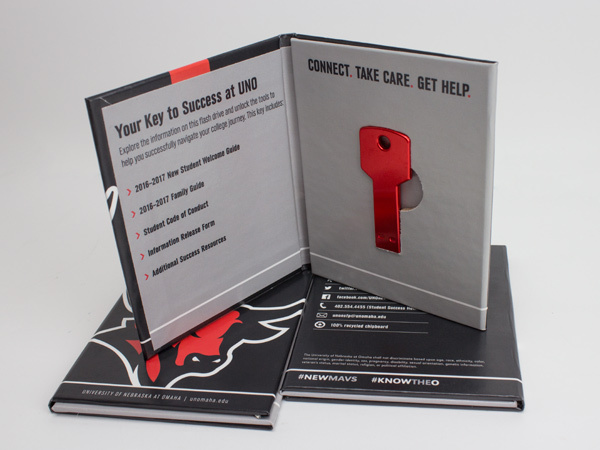 Don't just dispense materials - welcome new clients, homeowners, and students with distinctive, commemorative packaging. The FlashPad Wallet is slim enough to carry in your back pocket, but sturdy enough that it won't be forgotten.